I have been on a role with making infographics, but I feel like I need to have my geeky humor come through these days and you know… it feels great to put my graphic design skill and my own humor, so I NOW have a series called Info Geek Humor Graphics. I will still do infographics, but I think I need to mix in a little geek/ tech humor to my site. It just feels like the right moment to do that. I am not sure if it will be a weekly thing, but certainly something I will do when I have time. Haha, that’s funny! Mmm, pie. hmmm I knew there was reason I had to indulge in my morning apple pie today! The timing was perfect as it set the stage for your article about info graphics and how important a role they can play in anyone’s marketing strategy! Back when I learned about pie charts I wondered why they were called such. Seemed like a waste of thoughts that ran to cherries, apples, blueberries . . . and never got fulfilled! Really funny..It is making all hungry like you. All this talk about pie charts……..
Wow those works are really great. Thanks for providing us your info geek humor graphic pie charts, this information will give us an idea on how much we can earn online if we work hard like you do. Keep up the good work. Must be a very boring class… I can totally relate! Lol, these infographics are hilarious. What a great comic I sent it over to my friend at work made me hungry too. Hah, that’s cute Nile! Some of those infographics would take a long time to make, they’re very creative also. Are you Pinterest Nile? Good creation of infographic, you’ve a really originative and well pleased thoughts here..
mmmm pie, nice way to represent pie charts…………. Looks like someone know what happening in the real life of the geeks:) Very funny infographic! That is not only funny but great creative display. I love the way you navigate through that wonderful system to create such art. I would love to know where to get my hands on that system and if there are video training available for newbies such as me? Thank you for being one of my favoriate techies globally. I find it so easy to follow all your information. Others clutter their presentations and we get lost. Hey, I have years of experience yet not special as you. I can navigate overall yet design is something I am re-learning. I have several sites not blogs that I created back in the day. Now, things are more blog and setup is basically the same yet more twist. That requires people like me, to learn new things. I look forward in my new journey with you as my guide. I will master all this new design stuff and help unlimited people get something off the ground they can be proud of. Your special in our industry and I do appreciate the free training you gave and continue to give. Your truly blessed and I am honored to call you a friend. Thanks for really caring, Nile. You certainly have many talents! 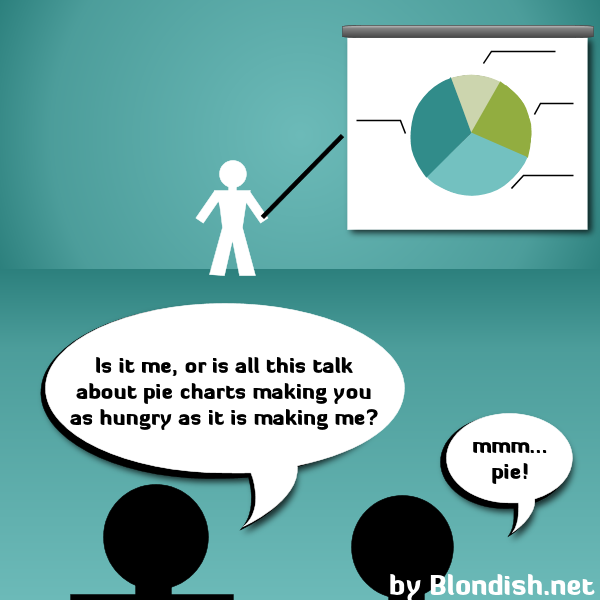 Your pie graph comic is really funny! I’m looking forward to many more! Thanks for the chuckle! Hah, nice infographic. The tough part for you is to show some useful content while still maintaining the geeky humor. I’ve seen very few graphics that can maintain this subtle balance. Very good sense of humor. This one made me laugh Nile! I wonder if it happened in real life. Haha! It is quite funny that the most obvious jokes are the most hilarious. I would like to see similar posts on a regular basis, like a weekly infographic. haha.. This is really very funny but so true! 🙂 Every time my teacher says the word pie chart I can’t help myself from imaging a nice cooked Pie.. Thanks for sharing this very hilarious humor graphic.. Hilarious! Pie makes me hungry too. Especially pizza pie! heheh. Yeah! Going a little off topic in your blog can release a bit of your stress in blogging. Why don’t you make a pie of cars? Or cars painted with info graphics. I think that would be cool. heheh. Funny infographic. It’s great to just wind down and have some fun amidst SEO and Trending Topics. Well Done! Very nice article. I have started to try and make infographics but have not had too much luck getting any traction. Are there other places to post my infographics to gain some traffic? Humor wins the day, made me smile Nile! When I see a chart I think at the numbers, not at the “pie”.